Evo-Stik Gripfill Solvent Free is a white, solvent free gap filling adhesive that creates a high strength bond between two materials. 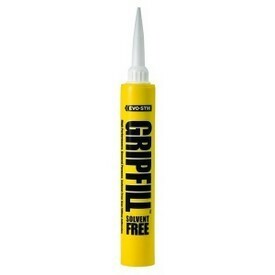 Gripfill Solvent Free provides an instant grab, immediately securing materials in place for accurate bonding. Gap filling properties mean uneven surfaces can be bonded without difficulty. Gripfill Solvent Free has been developed specifically for interior use and is ideal for decorating, refurbishment, building and DIY applications.